A tradition as famous as afternoon tea deserves a spectacular setting. The Grosvenor Hotel in Victoria is one London’s great railway hotels with period features and a fascinating Victorian heritage. 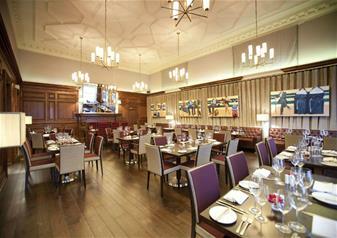 Enjoy afternoon tea in this centrally located hotel, just a short stroll from many popular London landmarks. You will be seated in the stylish Brasserie before choosing your desired Tea Forte tea blend. Sit back and relax as a tower of traditional tea foods is served, including open and closed finger sandwiches and a selection of handcrafted cakes. Finish with mini rich butter fruit scones – presented the British way with fruit preserves and thick Devonshire clotted cream. There’s no better way to spend a relaxing afternoon in the city than with this quintessentially British tradition of afternoon tea. Whether you want a romantic tea for two or to catch up over a scrumptious clotted cream scone or two with friends, this delightful experience will be one that you will never forget!